Isle Madame is a Canadian island located off the southeastern corner of Cape Breton Island in Nova Scotia. The island was settled by France as part of its colony of Île-Royale (present-day Cape Breton Island). It is presumed to have been named for Madame de Maintenon, the second wife of France's King Louis XIV. After the fall of Louisbourg in 1758, 4,000 inhabitants were deported. However, a group of ten Acadian families from Port-Toulouse fled to this Isle Madame where their descendants still live today. Following the Seven Years' War, Île-Royale and its constituent territories such as Isle Madame, reverted to British control. Some Acadian families also made their way from Massachusetts to Isle Madame in 1766. 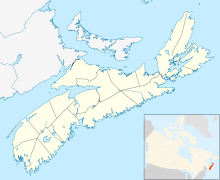 Measuring 16 km long and 11 km wide, giving approximately 45 km2, Isle Madame is jurisdictionally part of Richmond County and is separated from Cape Breton Island by a narrow strait named Lennox Passage. Initially, the strait was crossed by ferries. The first swing bridge crossing Lennox Passage to connect with Isle Madame was constructed beginning in 1916, and opened in 1919. The Grandique Ferry service also crossed the passage between Martinique and Louisdale. In 1970, following the grounding and subsequent breakup of the Liberian tanker Arrow in Chedabucto Bay spilling her cargo of heavy bunker C oil, the Government of Nova Scotia built a causeway between Burnt Point and Burnt Island to prevent the spilled oil from further damaging the fishing area of the Passage. Following the oil spill cleanup in the early 1970s, the old bridge was demolished and the ferry service was terminated after a new combined causeway and single-leaf bascule bridge (the Burnt Island Bridge) was built across Lennox Passage. Isle Madame is also connected by bridge to neighbouring Petit-de-Grat Island, and by causeway and bridge to Janvrin Island. Since 1994, the island has been served by a community television station, CIMC-TV, also known as Telile. This page was last edited on 19 November 2018, at 19:35 (UTC).